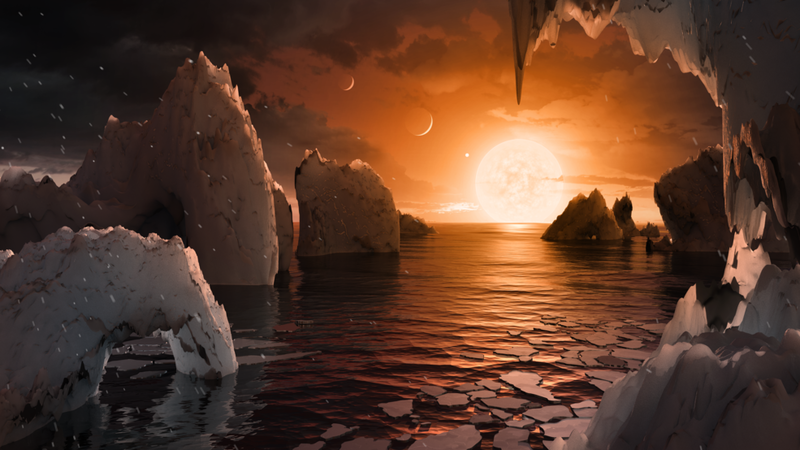 Based on their densities, all of the TRAPPIST-1 planets are likely to be rocky. Further observations will not only help determine whether they are rich in water, but also possibly reveal whether any could have liquid water on their surfaces. The mass of the seventh and farthest exoplanet has not yet been estimated – scientists believe it could be an icy, "snowball-like" world, but further observations are needed. In contrast to our sun, the TRAPPIST-1 star – classified as an ultra-cool dwarf – is so cool that liquid water could survive on planets orbiting very close to it, closer than is possible on planets in our solar system. All seven of the TRAPPIST-1 planetary orbits are closer to their host star than Mercury is to our sun. The planets also are very close to each other. If a person was standing on one of the planet’s surface, they could gaze up and potentially see geological features or clouds of neighboring worlds, which would sometimes appear larger than the moon in Earth's sky. Spitzer, an infrared telescope that trails Earth as it orbits the sun, was well-suited for studying TRAPPIST-1 because the star glows brightest in infrared light, whose wavelengths are longer than the eye can see. In the fall of 2016, Spitzer observed TRAPPIST-1 nearly continuously for 500 hours. Spitzer is uniquely positioned in its orbit to observe enough crossing – transits – of the planets in front of the host star to reveal the complex architecture of the system. Engineers optimized Spitzer’s ability to observe transiting planets during Spitzer’s “warm mission,” which began after the spacecraft’s coolant ran out as planned after the first five years of operations. "The TRAPPIST-1 system provides one of the best opportunities in the next decade to study the atmospheres around Earth-size planets," said Nikole Lewis, co-leader of the Hubble study and astronomer at the Space Telescope Science Institute in Baltimore, Maryland. NASA's planet-hunting Kepler space telescope also is studying the TRAPPIST-1 system, making measurements of the star's minuscule changes in brightness due to transiting planets. Operating as the K2 mission, the spacecraft's observations will allow astronomers to refine the properties of the known planets, as well as search for additional planets in the system. The K2 observations conclude in early March and will be made available on the public archive. Spitzer, Hubble, and Kepler will help astronomers plan for follow-up studies using NASA's upcoming James Webb Space Telescope, launching in 2018. With much greater sensitivity, Webb will be able to detect the chemical fingerprints of water, methane, oxygen, ozone, and other components of a planet's atmosphere. Webb also will analyze planets' temperatures and surface pressures – key factors in assessing their habitability. Date : 2/23/2017 11:43:00 π.μ.